Your Matisse-in-the-making can handprint their own stationery with this colorful kit. The stationery aisle's got nothin' on your little artist. 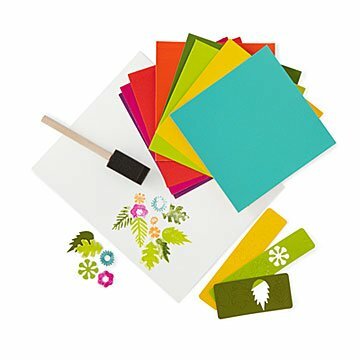 Here's what comes in this print-making kit: 24 sheets of brightly colored paper, cut-out shapes for stamping leaves and flowers, and a foam brush that works with any watercolor paint. It's for kids of all ages (we see you eyeing it!) and provides an artful alternative to screen time. Made in China.